If you’re looking forward to picking up a bargain this Black Friday, you might think this is as good as shopping gets. But look further east: China is leading the ecommerce revolution with Singles’ Day, the world’s biggest shopping spree. Held annually each November 11th, Singles’ Day generated four times as much consumer spending as Black Friday and Cyber Monday combined in 2017. This year – its 10-year anniversary – Chinese mega-retailer Alibaba is going international, rolling out a new strategy to snare foreign consumers. Singles’ Day is a relatively new retail phenomenon. It originated as a mid-90s celebration of singledom at Chinese universities, an opportunity for single people to meet up and party, as well as reward themselves: with many occasions in Chinese culture requiring gifts to be exchanged, Singles’ Day offers a rare excuse for self-gifting among young people. Retailers took note, embracing the day as a chance to target young consumers. Today, Singles’ Day is becoming more inclusive. Aptamil (powdered baby milk) and Moony (nappies) were among the top-selling imported brands bought by Chinese consumers in 2017, signalling its shift away from a cultural event towards the mainstream. There’s also evidence that consumers are moving beyond the bargain mentality, opting to make purchases based on product quality rather than price. According to Nielsen research, the desire to ‘buy something good’ is becoming a top consideration among Singles’ Day shoppers. This is good news for international brands, who have been capitalising on the perception that imported goods offer higher quality than domestic brands for several years. 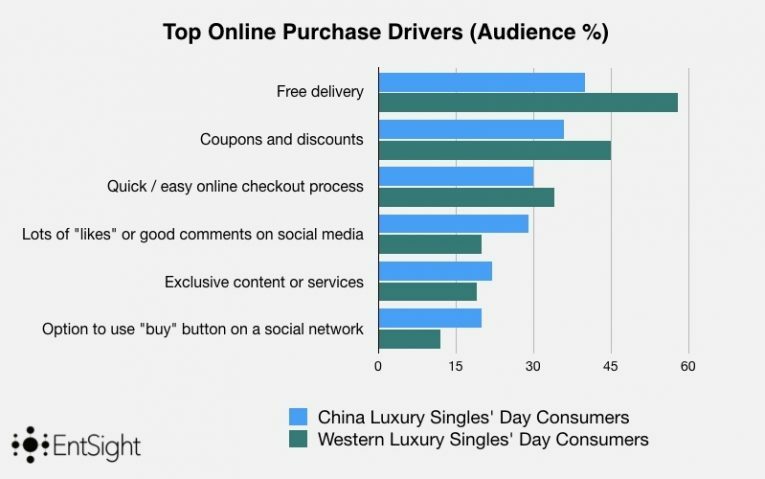 For those in the luxury sector, this presents an even bigger opportunity: 60% of Chinese consumers agree that they ‘tend to buy the premium version of a product’, compared to just a third in the US and UK, explaining why brands like Michael Kors and Ralph Lauren have been proactively targeting the Chinese market via WeChat ahead of Singles’ Day. Liberty London is the latest Western brand trying its luck in the country, partnering exclusively with luxury ecommerce platform Secoo to sell its products to a user base of over 20 million. For international luxury brands looking to get involved with Singles’ Day, a mobile-first strategy is key. 54% of Chinese luxury consumers in the Singles’ Day age demographic (approximately 20-40) made a purchase via mobile during the past month, according to GlobalWebIndex data, 10 percentage points more than a comparable audience in the US and Europe. Furthermore, a huge 81% of these Chinese consumers use mobile shopping apps, compared to less than a third of Western luxury consumers. Paying for items via mobile apps like Tencent’s WeChat Pay and AliPay – the Chinese equivalent of PayPal, owned by Alibaba – has become ubiquitous among young Chinese, partly due to the difficulty of accessing cash and point of sales terminals in the country. These apps are primary methods of both online and offline purchase, integrated with the wider Alibaba and Tencent ecosystems: so social media, messaging and payment technology are all interwoven in the same platforms. This also highlights why social media referrals are so vital for reaching Chinese luxury consumers. Positive comments and engagement on social media prompts more than a quarter of this audience to buy a product, while having the option to make a purchase directly from a social media platform motivated 20% of the audience to buy. By comparison, service-orientated drivers like free delivery appealed to those in Europe and North America. In China, Alibaba is already acting on these audience behaviours ahead of Singles’ Day in the form of its Smart Pop-Up stores. These physical stores make potential customers scan their AliPay account upon entry, serving curated recommendations depending on their purchasing history. 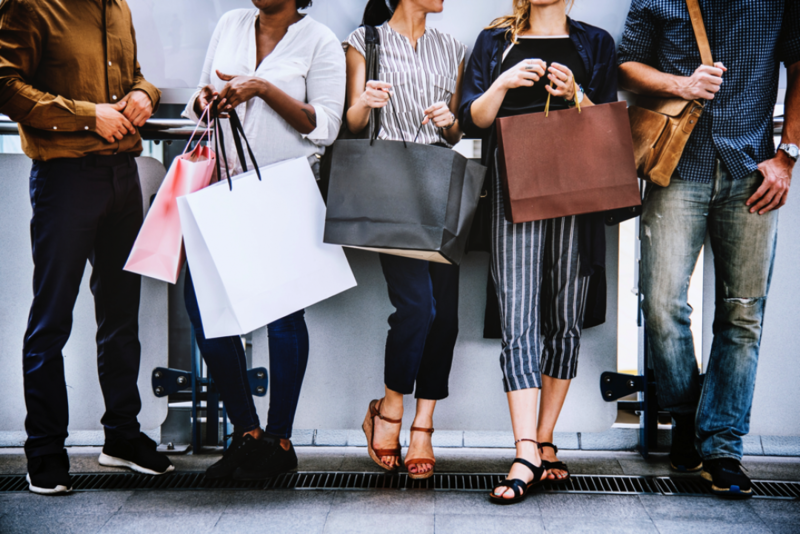 There’s even facial recognition technology providing discounts on items customers smile at in the store or that they’ve searched for online, as well as the opportunity to ‘test out’ fashion and cosmetics products virtually using RFID and AR tech. Western brands might be making an impact in China, but can Chinese retailers reach consumers in Europe and North America? The jury’s still out. Alibaba’s New Retail Strategy – which integrates online and offline customer journeys through clever use of technology – hopes to partly address this, leveraging ecommerce platforms Tmall World, AliExpress, Alibaba.com and Lazada to target shoppers in these regions. English language websites AliExpress and Alibaba.com are set to have a particularly pivotal role here, offering discounts and worldwide shipping. Consumers in East Asian countries such as Singapore, Malaysia and Thailand will see a fuller realisation of the strategy in the form of events hosted through online shopfront LazMall and Lazada Marketplace. However, the wider market beyond Asia is a different beast. For a start, usage of Chinese ecommerce and technology platforms remains low: only 13% of luxury consumers in Europe and North America, for example, have used AliExpress in the past month. The 11/11 date also clashes with Armistice Day in the UK, a key market for Alibaba. Yet despite this, interest in Singles’ Day does seem to be growing in the West. In the UK alone, more than a third of the population aged 16 and over are single, with marriage rates in decline since the 1970s. A celebration of singledom makes a compelling hook for a retail holiday. This increase is illustrated by social data: in the run-up to the event, 19% more people talked about Singles’ Day online this year compared to the same period in 2017. A big contributing factor for this has been Nike Air Jordan’s limited-edition Singles’ Day 4 sneakers: driving 39% of all event conversation from Europe and North America since 1st October, this illustrates how savvy brands can get a slice of the Singles’ Day pie. By comparison, KOLs made a big impact in 2017. 12% of all Singles’ Day discussion between 1st October – 14th November – the entire retail campaign period – featured members of the enormously popular Korean boyband BTS talking about the event. While this wasn’t part of any official outreach activity, it prompted many fans to ask what Singles’ Day was. Could K-Pop stars be the ambassadors Singles’ Day needs to truly take it global? Selecting appropriate celebrities to endorse the event is certainly one route to broadening its reach among young target consumers - a challenge that we at EntSight have tackled numerous times on behalf of brands. However, the biggest boost may be time, as the rest of the world catches up with the kind of innovations in mobile commerce currently enjoyed by Chinese shoppers, and young consumers demand a seamless retail experience. Until then, see you at the shops. If you're interested in learning more about the Brand & Entertainment Audience Intelligence solutions we offer here at EntSight then take a look at our website to find out more or drop us a message.